Executive Hire Show 2017 – the Hire Event of the Year! Home » News » Executive Hire Show 2017 – the Hire Event of the Year! The 11th Executive Hire Show is opening its doors to hire industry professionals on the 8th and 9th February 2017 at the event’s established home at the Ricoh Arena Coventry UK – in the heart of the Midlands. Plant & Civil Engineer have been a long-term supporter of the show and will be attending the Show as a visitor in February. The Executive Hire Show has become a hub for the hire industry and year on the year the show increases in size with more exhibitors and a plethora of brand new products on display. For 2017 a new area has been created – the ‘Hire Show Hall’ – where a direct link has been created from the Main Hall into the Lower Halls. Expect to see the biggest name suppliers to the UK hire industry at the 2017 show – to date the event has 182 exhibitors – of these 50 are brand new to the event – the Main Hall and Atrium areas are now sold out! The Show may only be a two-day event but its reach and its influence continue throughout the hire industry throughout the year. New products are at the heart of the Executive Hire Show and it’s the place where visitors get to see new potential profit earners and take advantage of show only deals! There’s also the innovation trail where the most innovative products at the show are highlighted and then judged by ‘secret shoppers’ to find the outright winner! The Innovation Trail Winner in 2016 was Morris Site Machinery with its Makinex PHT-140 powered hand truck. Exhibitor line-up – who’s who? The 2017 exhibitor list is looking very impressive – with the majority of the key players, in the hire industry taking stands. These include A & Y Equipment, Altrad Belle, Atlas Copco, Avant Tecno, Bomag, BTE Plant Sales, Doosan, Firefly Solar Generators, GenQuip, Greenmech, Hire Supply Company, Husqvarna, Ifor Williams, JCB, Knott-Avonride, Kranlyft UK, Kubota, Leica, Mace Industries, Makita, Manitou, MHM Plant, Niftylift, Obart Pumps, Ridge Tools, Shindaiwa, Sumner, Thwaites, Topcon, Wilkinson Star, Yokota and Zenith. 50 New exhibitors at the 11th Executive Hire Show and counting! Brand new exhibitors that have committed to the 2017 event include: Astrak UK, AV Industrial Products, Camberwell Plant Hire, Caterpillar Inc, BGG UK, Briggs & Stratton, Castle Brooke Tools, CCL, CEMO, Datatag, Carrymate, Diaber Benelux, EC Hopkins, North West Tools, FG Wilson, FLEX, GGR Group, Harford Attachments, HTS, Identipro, Imex tools, Klingspor, , LEAA, Leach Lewis Rubber Tracks, , LISSMAC Maschinenbau GmbH, Mexco, Multiquip, National Flooring Equipment, Niftylift, Nightsearcher, Off-Grid Energy, Osborn Unipol (UK), Padley & Venables, Paragon Protection Systems, Radiodetection, Redwood Global, Reflex Trolleys, Russon Access, RVT Group, Snorkel UK , Stanley Handling, Tammet Systems, The Equipment Network, Trime (UK) & Van-Line, W Robinson & Sons, Wyndham Page. What’s new? – A look at some of the new products being launched at the Executive Hire Show. New exhibitor, Datatag, is coming to the Show with the company’s new ‘Security Identification System for Small Hand and Power Tools’ – Micro-CESAR. The new Datatag security system Micro-CESAR is set to make a huge impact in the fight against small tool theft following in the footsteps of the CEA’s (Construction Equipment Association’s) CESAR System which uses an array of Datatag security marking technology. Like the official CESAR Scheme, Micro-CESAR uses Datatag security marking technology including a unique RFID tag and a tamper proof warning/registration label with an integrated QR code. Micro-CESAR and CESAR are designed to act as both a deterrent against theft and as an invaluable aid in recovery. CESAR, launched in 2007, has contributed to a 70%+ reduction in the theft of large construction equipment and Micro-CESAR is poised to make a similar impact protecting small construction tools and landscaping equipment such as power tools, cut-off saws, hand-held hydraulic breakers and compaction plates. Telematics solutions provider CanTrack Global return to EHS in 2017. During a busy 2016, following EHS, CanTrack has widened it product range with the launch of a new lone-worker safety device called people. CanTrack’s product range now allows the continuous monitoring of construction equipment fitted with Asset, vehicles fitted with GPS and workers carrying People on one web browser. CanTrack Asset has an enviable reputation for protecting equipment with a recovery rate of over 90%. Now CanTrack can protect lone workers with a system called ‘People’ which functions through a small device no bigger than a car key fob. Developed to provide safety and security for lone workers in remote and potentially hazardous environments People delivers continuous and accurate real-time location reporting, an SOS alert to mobile phones, intelligent fall detection and more. Brand new exhibitor CCL Components will be exhibiting a new portable battery system which offers reduced costs with fuel and carbon-free power generation. CCL Components, one of the UK’s largest distributors of renewable energy systems and solutions, has developed a new portable hybrid power system which it believes will enhance the off-grid energy market and provide a myriad of benefits for a wide variety of industries. The company has chosen the EHS to introduce this new technology to the hire sector. 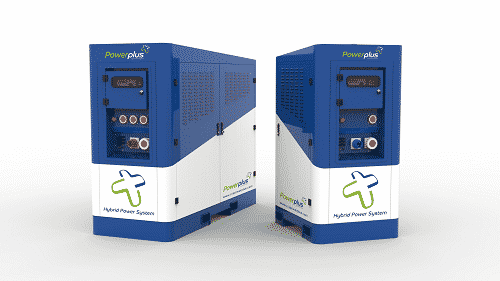 According to CCL, Powerplus is a flexible battery system which can be used alongside, or in place of, existing power generators to deliver major energy savings and reduced carbon emissions. With additional benefits of reduced noise pollution and significantly lower maintenance requirements, it has been estimated to deliver an average of 30-50% cost savings against conventional power generation models. SPS is launching the latest Rhinox Buckets innovation which SPS, say will help Plant Hire companies and Utilities contractors save money and save lives! Ground-Guards is a ground protection innovator across a wide spectrum of industries, including construction, civil engineering, mining, drilling, landscaping, heritage sites and more – has developed a revolutionary new ground care system called MaxiTrack, which, according to the company, is turning the ground care industry on its head. MaxiTrack is a super strong, environmentally friendly ground mat that is lightweight, easy to lay and safe to carry by hand. It is made from a lightweight polymer called Zetralene which is five times stronger than standard HDPE and certified to support heavy loads of up to 130 tonnes. Despite this extreme strength, MaxiTrack is also remarkably light. Mats only weigh 40kg, which means that two workers can safely handle them without the need for expensive lifting equipment, thereby providing a much-needed cost-effective alternative to traditional aluminium panels. 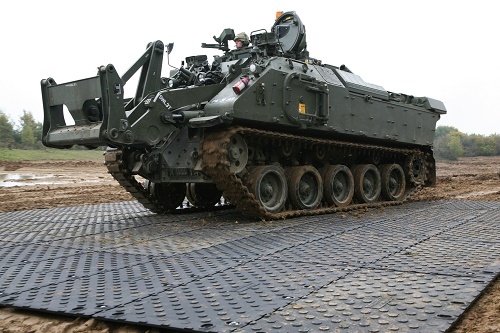 It is the perfect solution for laying down portable access roads or providing temporary ground protection for construction projects, industrial sites and large events. MaxiTrack mats are made from 100% recycled plastic and are also recyclable at the end of their lifetime, satisfying the growing need for a sustainable ground care solution. They are also silicosis and contamination safe. 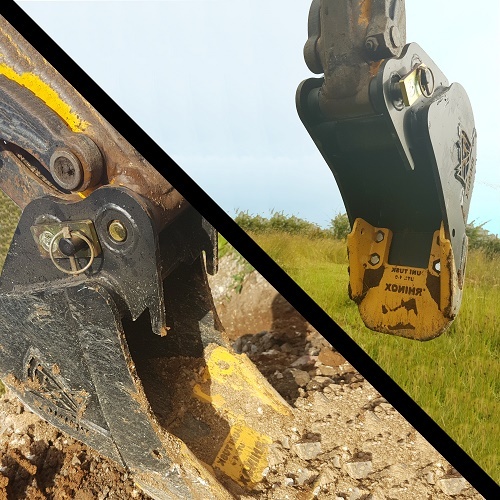 Harford Attachments has been designing and manufacturing excavator attachments in the UK for over forty years. The company is exhibiting at the Executive Hire Show 2017 for the first time. According to Harford Attachments the company’s quickhitch systems will improve the productivity, flexibility and potential of a machine. They combine safety and simplicity of operation with outstanding build quality. Harford’s range of quickhitches, or couplers, suit the most demanding jobs that diggers will have to cope with. 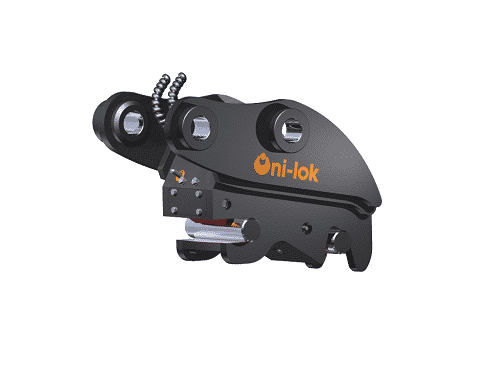 With a choice of mechanical or hydraulic hitches, their quick hitches work with most makes and models of equipment for quick and safe attachment changes. The Harford Safelock® Quickhitch System simplifies the running of a mixed fleet of excavators. Harford say that it saves money every day by dramatically reducing bucket changeover times. The simplicity of its design means it is extremely low maintenance. Trailer Engineering will be launching the company’s brand new 2000 litre water stackable tank suitable for portable or site water, they are designed to maximise logistics with a footprint of 1250mm x 2500mm which means you could fit up to 20 on one wagon saving massively on transport costs. Visitors can see the new tank just outside the North and South entrances into the show and you Trailer Engineering would like to invite visitors to come and speak to the team on stand E95 in main hall. Paragon Protection Systems is making its Show debut in 2017 and introducing the Zappshelter system, which is described as a revolutionary system for providing rapid cover for a range of on-site applications, both temporary and permanent. Zappshelters comprise of a galvanised steel arch structure and a tough fabric membrane which offers great protection from the elements for many years. It’s ideal for storing plant and access equipment, and has limitless uses for anyone requiring significant covered storage or work-space. Designed and engineer-certified for the world’s harshest environments, Zappshelters can provide flexible temporary or permanent covered areas for many different locations. They are available in a great range of widths, and the work perfectly with standard steel shipping containers and precast concrete walls. Paragon report that the Zappshelters are rapid to install and can be erected using only the most basic of equipment; also, the system usually requires no planning permission to construct, and are easy to dismantle and relocate as needed. Morris Site Machinery will spotlight the latest innovations in power, lighting and welding to help hirers grow their business and harness the full potential of their machines. The company is bringing more solutions and technology focused products to build on last year’s award-winning theme of opening ‘A World of Possibilities’ for the industry. It will unveil its next generation lighting tower range, including the TL90 Ultimate at the event. This new addition has up to the minute engine technology from Perkins and Kubota offering longer run times and is fitted with a Deep-Sea control panel with telemetry options to give operators advanced monitoring, more traceability and security. The four 300W LED lights provide fuel efficient and crisp, clear instant light. The show will also launch the company’s limited edition range of Cobra inverter welders. The ArcGen Cobra 500i has real bite; a multi-process inverter welder that is a lightweight but powerful welding power source. Hird is giving its customers two new mini floor cranes for the price of one with the new Wienold MFC750. The machine is available exclusively from mini crane, glass lifting and access hire specialist Hird – and goes on show in the UK for the first time at the Executive Hire Show. It is expected to impress visitors from the FM, building fit-out and construction sectors needing a crane that combines easy-to-use, highly compact design and impressive lifting performance. 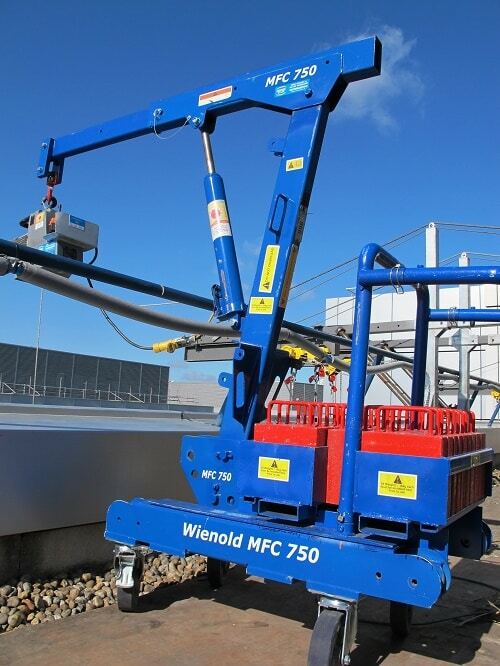 One of the key advantages of the Wienold MFC750 is that it is, in effect, two counterbalance mini floor cranes in one. In its MFC 750Ks set-up – known as the Shorty – it is just 650mm wide and 1200mm long, yet can lift up to 475kg. It can also be adapted on-site by adding extension legs, that turn it into the MFC 750K, with a maximum lift capacity of 900kg. Yet it is still only 1800mm long. Hird’s glass lifting team worked with German manufacturer Wienold to design the mini floor crane. Hird Director John Wilding says: “Our aim was simple. Create a mini floor crane that is as compact as possible but which can lift as much as possible. The MFC750’s ultra-short wheelbase has already been used to good effect to install glazing panels at BBC White City, in West London. Castle Brooke Tools UK will be attending the Show for the first time and will display the company’s range of Percussive Steels and spiral drill bits for use with Electric, Pneumatic and Hydraulic Hand Held Breakers and Drills. Showing for the very first time in the UK will be, what the company describe as, the revolutionary 32×160 Heavy Duty Tarmac Cutter, which reduces exposure to the operator to hand arm vibration as well as extended working times. The new Tarmac cutter offer significant health benefits to employers by reducing the Hand Arm Vibration (HAV) exposure by up to 30%. Regular exhibitor Avant will showcase the recently announced E Series of electric compact tool carriers at EHS 2017. The development of the Avant E Series is just one example of the company’s continuing commitment to provide the hire industry with a comprehensive choice of innovative equipment and accessories. Besides being super versatile, the new electric machines offer zero emissions and minimal noise level. This new range of tool carriers is extremely user-friendly, making them ideal for the hire market with a choice of more than 200 attachments for outstanding on-site adaptability. Avant manufactures a wide range of compact, 4-wheel drive machines, which can be fitted with a very comprehensive range of accessories to meet the many varied requirements of the hire market to make general maintenance jobs, easy and less labour intensive. 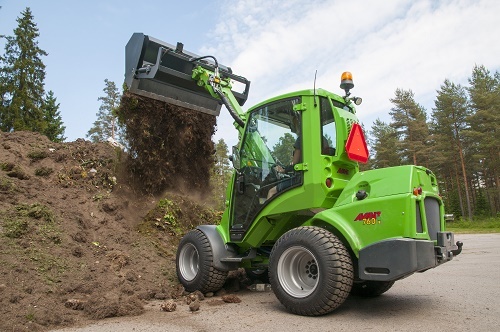 The machines and attachments can be used in many areas, from Construction to Demolition, Equestrian to Forestry and Farming to Local authorities, this makes an Avant a must-have for almost any business. Avant will also be exhibiting a range of machines, together with a selection of the very latest high quality attachments including new hand tools. The Topcon GB & Ireland team will be displaying the latest technology to aid smarter working on site as well as showcasing how today’s construction professionals can safeguard equipment from theft on site. 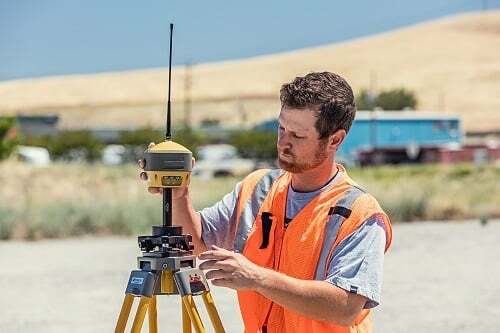 On the stand, will be Topcon’s most recently launched Elite Survey Suite, a system combining three cutting-edge survey products with a single software solution – designed to give professionals a powerful and integrated surveying workflow. The Suite includes Topcon’s new GT series of robotic total stations, HiPer HR hybrid GNSS receiver, FC-5000 field controller and the latest MAGNET 4.0 software programme that seamlessly links together the different stages of the workflow. Topcon’s unmanned aerial system, the Falcon 8, will also be on the stand. With its rotary-wing system and robust design, it is designed to tackle inspection and survey tasks in challenging environments. The Falcon 8 is even able to compensate for high winds, reducing the need for pilot corrections. The technology is designed to be straightforward to use with a user-friendly control system, as well as an autopilot. The positioning partner will also be showcasing its security software, TSshield. 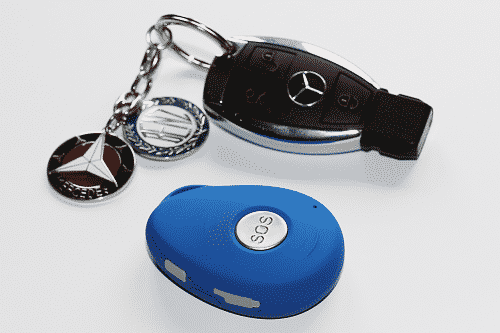 With its remote locking functionality as well as locating technology, TSshield helps protect devices from theft, an issue that affects two out of five surveyors in the UK. Nightsearcher produce professional lighting products – the company will be at the Show for the first time. In 1989 Colin Howard, managing director, began manufacturing NightSearcher products, designing and specialising in rechargeable lighting solutions. These products were specifically supplied to the uniform and industrial markets, where NightSearcher has developed a high reputation. According to Nightsearcher the company make the most powerful portable LED floodlight in the world, which it reports that the product completely replaces inefficient halogen based lights operating off generators. 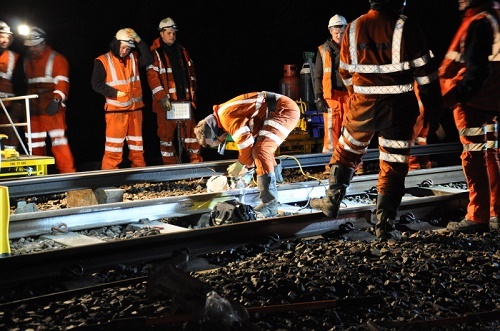 NightSearchers continued success and gradual expansion is aided by the dynamic nature of health and safety requirements, coupled with the demands from both new and existing market sectors. 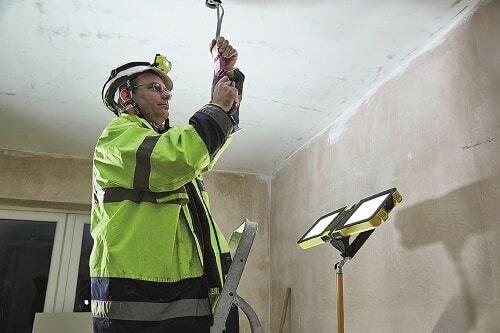 Its product range now includes carefully selected searchlights, hand-lamps, floodlights, flashlights, headtorches and lighting for hazardous locations. Many of the company’s products are now exported to countries throughout the world. NightSearcher is registered to ISO 9001:2000 standard and have products listed with NATO stock codes. Once again, inspHire will be exhibiting at the Executive Hire Show and the company is looking forward to showing off the new features they’ve been working on recently. Managing Director, Graham Dobbs said “We’ve attended every Executive Hire Show to date and we’re back again in 2017. Having worked incredibly hard since last year’s show we’ve got a range of new features to demonstrate. We’re particularly excited to introduce our new Routing Functionality as well as features we’ve added to inspHire Mobile and our Web Portal”. 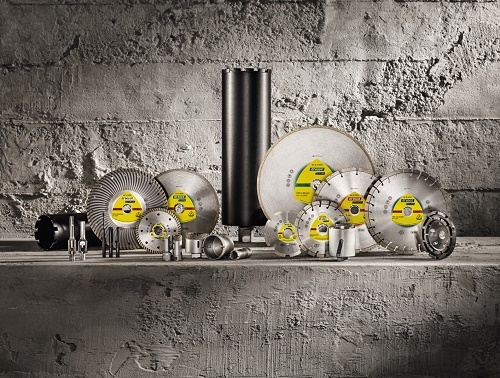 Brand new exhibitor Klingspor is showing its new range of high performance diamond cutting tools and which will be launched at the Show. Klingspor’s comprehensive new range of diamond tools makes it easy for any user to work faster and with greater precision and endurance. All the diamonds and raw materials that Klingspor use are supplied by the most renowned manufacturers to ensure consistency in the quality of its products. As they are made of carefully tested premium grade materials, the products included in each product line offer a wide range of possible applications and meet the highest safety standards. Klingspor offers three finely attuned product lines, ensuring the right tool for all applications. The EXTRA range – Brand name quality at an affordable price. For users who expect their tools to meet professional standards but do not need to use them continuously. 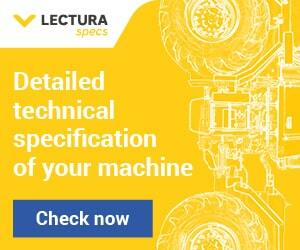 The SUPRA range – Professional tools with an exceptional price-performance ratio. For users who require diamond tools that deliver a reliable and powerful performance every day. The SPECIAL range – High performance tools offering outstanding cutting performance and service life. For users who need their tools to perform at peak output and reliability even if subjected to the most punishing applications. Ideal for construction sites and rental usage, MAC3 Europe’s tools reflect the company’s focus on innovation to match ergonomic design, high productivity and low energy consumption. Users quite often fail to lubricate their tools correctly which results in damaged and broken vital parts – MAC3 chooses the materials and the design of the components used in the manufacture of its tools to eliminate the need for any additional lubrication. Energy efﬁciency solutions include an extremely low air consumption of MAC3 hammers – in fact MAC3 claim that its hammers use 25% to 60% less than equivalent models available on the rental market – this in turn helps rental companies choose the right compressors for the job. Health and safety is also an important factor. MAC3 helps rental companies with innovative solutions and an ergonomic design to protect users and prevent from risks on the work-site. MAC3 has patented a new technology where the latest AIRGO® breaker has been designed with fixed handles and ensures an extremely low vibration level – below 5 m/s². Therefore, exposure of vibrations to the user is considerably reduced – which will reduce the risk of HAV. The vibration levels on the AIRGO® breaker and hammer were confirmed by French National Laboratory of metrology and tests (LNE) – which is an independent authority which carried out the tests under real on-site conditions. The AIRGO® range covers different models of paving breakers and pick hammers. 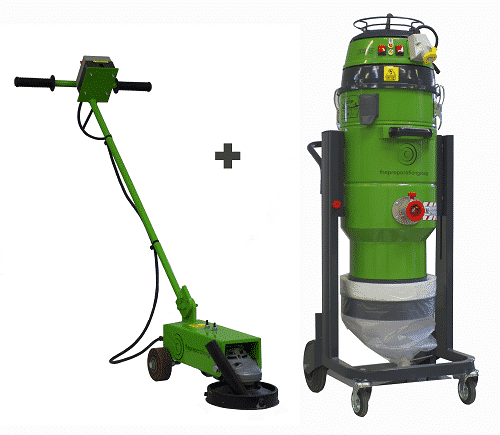 The Preparation Group, specialists in surface preparation, removal and finishing, is showcasing its new 180 Grinder and 202DSLP Vacuum package, a revolution in removing problematic materials whilst at the same time controlling and minimising exposure to dust. The compact 180 Grinder might not look as big and impressive as other 110v/240v grinders on the market but it packs a punch, efficiently removing all traces of sticky compounds and powdery substances including in tight areas normally inaccessible to larger plant. It has a powerful 2.5kw motor, interchangeable accessories and features a folding handle to make the 180 easy to store and transport. A unique dust shroud design prevents restriction of movement and connects it to the 202DSLP Vacuum for a dust free operation. The 202DSLP has a ground-breaking airflow system for high suction levels and a Longopac® Safe Bagging System where a continuous feeding bag collects dust and is sealed with tie wraps into manageable lengths for disposal, ensuring that all airborne particles are safely contained. It features a unique, innovative ‘Dustop’ filter cleaning system for increased productivity where its own suction capacity also cleans the filter. Independent twin motors save energy for tasks that produce lower volumes of dust and the built-in socket provides direct power to the tool in operation. An adjustable height mechanism, when not in use, reduces the 202DSLP’s size to 1190mm for transportation and storage. Surface preparation company, National Flooring Equipment, will showcase its innovative flooring machines at the Executive Hire Show in February 2017. The American company, which recently announced its European launch, is making its UK trade show debut. 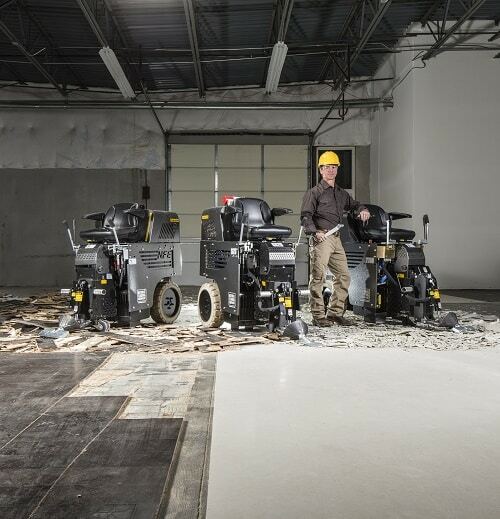 National Flooring Equipment will showcase some of its popular equipment including four innovative floor strippers; National’s workhorse – the 5700 Ride-on stripper, the 6280 Walk-behind stripper, the cost-effective 5280 Walk-behind stripper and the Power Hammer Trolley. The equipment is manufactured by National Flooring Equipment in the US, but it is perfectly compatible with the European and international markets. The new BVP 10/30 lightweight plate that was previewed by BOMAG at Hillhead in June will be officially launched at the Executive Hire Show. The new plate has a 300mm working width and weighs in at just 47kg. Powered by an economic and reliable 2.1kW Honda GX100 petrol engine the plate is ideal for small jobs in construction, landscaping and utility contracting. The maintenance free exciter system operates at 100Hz and produces 10kN of centrifugal force at an amplitude of 1.34mm, making it the most powerful lightweight in its class. BOMAG engineers designed the new plate to be as safe and user friendly as possible and this resulted in very low HAV of just 2.5m/s2 with the vibration insulated steering bow that will be standard on UK machines. As users will expect of a BOMAG the machine is well designed and built for a tough life on-site. An optional Vulkolan mat is available for use on block paving to minimize the risk of damage and reduce noise. WernerCo is a leading manufacturer and distributor of access towers, podiums and low level work systems – the company showcasing its BoSS range at the Show. BoSS will feature a range of working at height solutions during the two-day event, giving visitors the opportunity to see first-hand the market leading products available on the market. Taking centre stage on the stand is the new BoSS BS1139:6 compliant Linked Tower Scaffold and Cantilever systems. These tower builds utilise standard BoSS components in order to create more complex structures for specialist applications. The Linked Tower Scaffold provides access over and across obstacles whist the Cantilever system creates a safe working platform from the tower when the main structure cannot be located alongside the point of work. New on display this year is BoSS’ braced StairMAX700, which has been designed for commercial and domestic stairwells, featuring a working height of up to 13 metres and is ideal for internal and external use. CPA will be promoting its ‘Stars of the Future’ award scheme, now in its fifth year, for trainees in the plant-hire industry held in conjunction with many UK colleges offering plant mechanic apprentice training. CPA will also use the EHS to hold an ‘Open Meeting’ on the first morning of the show – Wednesday 8th February. The open meeting will cover new projects the association is planning to undertake in 2017 and topical issues in the hire industry.